When it comes to the GoPro, you really can’t go wrong. After all, they are the most popular helmet camera producers in the world. 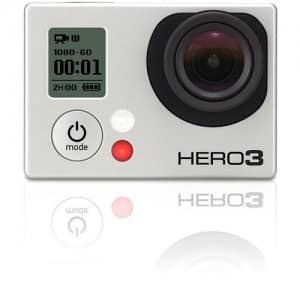 The latest release of the GoPro 3 Hero has really made GoPro fans happy and new customers are getting amazing value for their money. The action camera market has become competitive and the race to take the lead clearly has this one in the lead. This camera takes full HD video (1080p), while allowing other settings (960p, 480 etc) and the still shots are a massive 12MP. As far as camera’s processor power is concerned, this is something the Drift simply can’t compare to. They’ve got a brand new processor that makes the camera faster and take better quality. 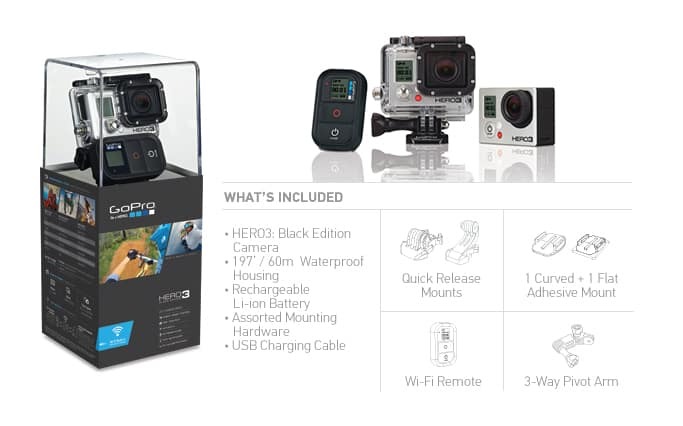 What else is new is the GoPro now comes with a remote control! Yes, finally they include a remote control in the basic package. This is where they were falling behind Drift for such a long time but now they have caught up. Way to go! While there are some great features, it doesn’t make this camera a winner just yet. Some people were a little frustrated as battery life was not all that great, as it comes with a 2.5 hour battery life per charge. There is however a remote control that comes with the camera which is pretty neat for many users. The price of the camera additionally isn’t that bad, and can average at about $399 on most online shopping sites. This camera offers versatility and compatibility to those who have plans for getting great action shots. 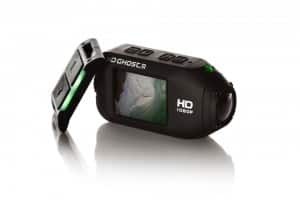 The HD video quality allows you to capture all of your favorite moments and with the ability to be mounted on many different surfaces, this can allow you to get stable shots unlike having to hold the camera. The Drift HD action camera has been newly released and weighs in at 167g. This is about 15g more than the Go Pro. You get the usual sturdy casing.. so you can go anywhere.. even under water (up to 3m) without needing a special waterproof case like the GoPro. Users can take it just about anywhere until it comes time for diving. Turning this camera on and off has never been easier with its included remote – now with lights on the remote – so you can tell at a glance if the camera is recording or not. Similar to the GoPro, it offers WiFi and the ability for you to see what’s going on via a system of indicator lights. While the processing speed of the Drift HD Ghost is great, it can’t touch that of the GoPro. The LCD built-in screen of this camera is 2 inches and this gives this camera a heads up over the others. The 3 hour battery life is also a lot better than the GoPro but not by much. It offers a 3 hour record time as well and with a 1700mAh battery this is definitely a lot better than the GoPro. Drift flashback video tag/loop: for sports enthusiasts this can help save a recorded event for up to 5 minutes after it’s taken place. Read my full Drift HD ghost review to learn more about this feature. 2 inch LCD screen that features Gorilla Glass: you’ll be able to enjoy real time viewing before you even press record. Instant video playback is enabled as well and with the Gorilla Glass this helps protect the screen from scratches. Enhanced 7 Element Lens Design: this is a huge upgrade and consists of 7 elements and it’s designed to offer pure performance regardless of if you are filming the desert or something on top of a mountain. It’s hard to say, but just like the previous battle between the Drift HD and GoPro 2, I’d have to go with the Drift camera. Simply because it comes with a built-in LCD screen and the battery life is a little longer. For more details and info on current prices and availability, please check the cameras via the links below.. Thanks for reading my comparison between these two major helmet cameras! I hope it helps you in the buying decision to get the best one suited for you.